Last week Robert asked me to do a guest gig for his postgraduate course THEO700 Doing Theology in Context. At the moment the course is looking at the history of biblical hermeneutics. My job was to talk about the shift in Early Modern biblical interpretation towards philology (the original Biblical languages) and critical history. From the 16th century there was a growing assumption that you couldn’t do Theology until you had a good grasp of the original Biblical languages, as well as some sense of the historical context in which the biblical texts were written. For the earlier point of view, one has only to look at the way in which the Faculty of Theology at the University of Paris spent the first half of the 16th century condemning “humanists” (i.e. literary scholars) who “presumed” that their grasp of Hebrew and Greek gave them a right to talk about Theology. In 1536 the Faculty went as far as to declare that Hebrew and Greek were unnecessary for a Theologian; Latin would do quite nicely. Another way of describing this paradigm shift is to say that in the Middle Ages, Theology took priority over biblical philology and history. After the Middle Ages it was the other way round. There’s a sense in which this is true, but McGrath, as ever, risks making it sound as if the Medievals were good Protestants. In fact, the Medieval reading of Scripture was shaped by an ancient and extremely complex tradition of scriptural commentary that is usually baffling to modern readers who have been trained to give priority to concerns like the meaning of the original text in its historical context. All this his came back to me during the weekend when I was going back through some photos I took when I was in Belgium at the end of 2013, and was trying give them captions before I uploaded them to Flickr. Now that I’ve done a bit of background reading on them, I thought I’d reproduce these images here with a short commentary as another example for students in THEO700 (and anyone else who’s interested) of the foreign world of Medieval biblical hermeneutics. 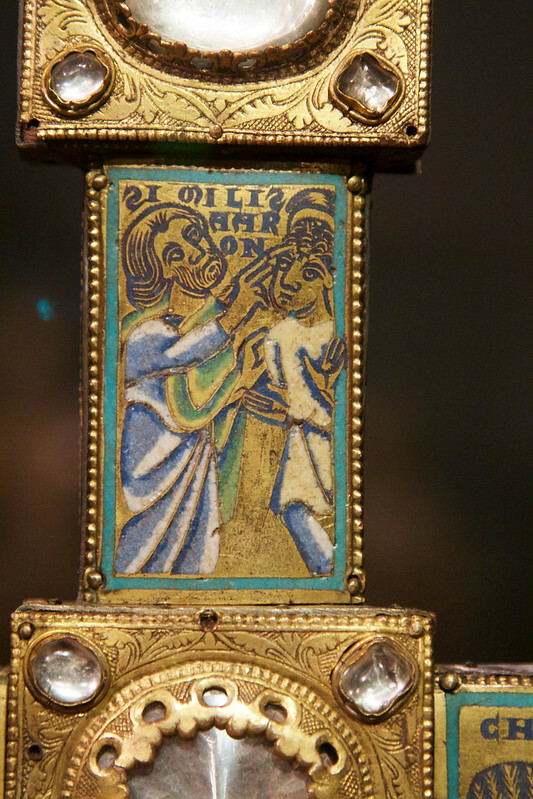 The images below are taken from two 12th century processional crosses in the Musée du Cinquantenaire in Brussels. Both are made of wood covered in gilded copper and silver. 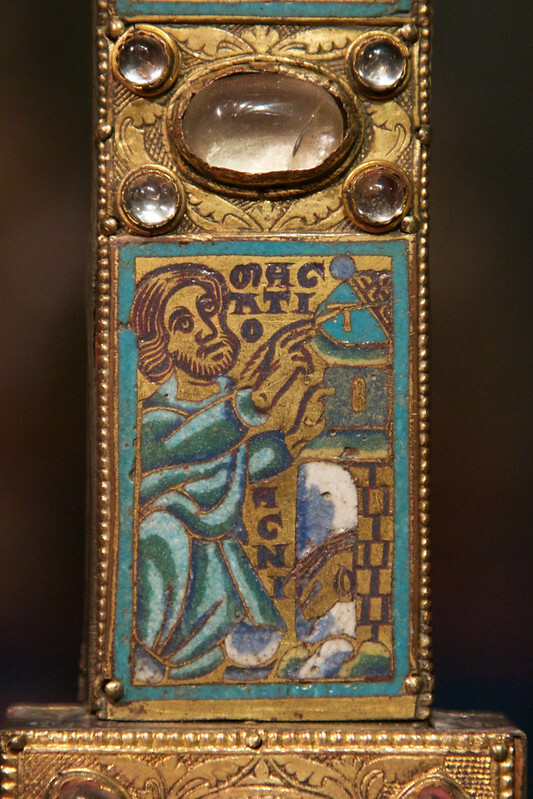 The images are enamel inlays and they draw typological connections between the crucifixion and episodes in the Old Testament. Some of the connections are already there in Scripture; others aren’t. Unfortunately I neglected to take a picture of the complete crosses, so you’ll just have to imagine them. On the lower vertical of the cross we have Moses standing before the bronze serpent which God commands Moses to make in Numbers 21 as a remedy for the fiery serpents He’s just sent to punish the Children of Israel. The ingrates have been whingeing about being led out into the wilderness and having only disgusting manna to eat. The connection between the bronze serpent and the cross is made in John 3:14-15 where Jesus predicts that he will be “lifted up” like the bronze serpent, and will bring eternal life to whoever believes in him. While this typology strays far from the literal meaning of Numbers 21, early Protestant interpreters considered it legitimate, because it was already established elsewhere in Scripture. It took a lot of searching before I discovered that this was connected with Ezekiel 9:4-6, where God calls to a man dressed in linen – read as Aaron the High Priest in this image – and commands him to place a “mark” (RSV; Septuagint) or “tau” (Hebrew; Vulgate) upon the foreheads of the men that sigh and mourn for all the abominations that are committed in the midst [of the Temple] (Douay-Reims)… Utterly destroy old and young, maidens children and women, but upon whomsoever you shall see the Thau, kill him not, and begin ye at my sanctuary. 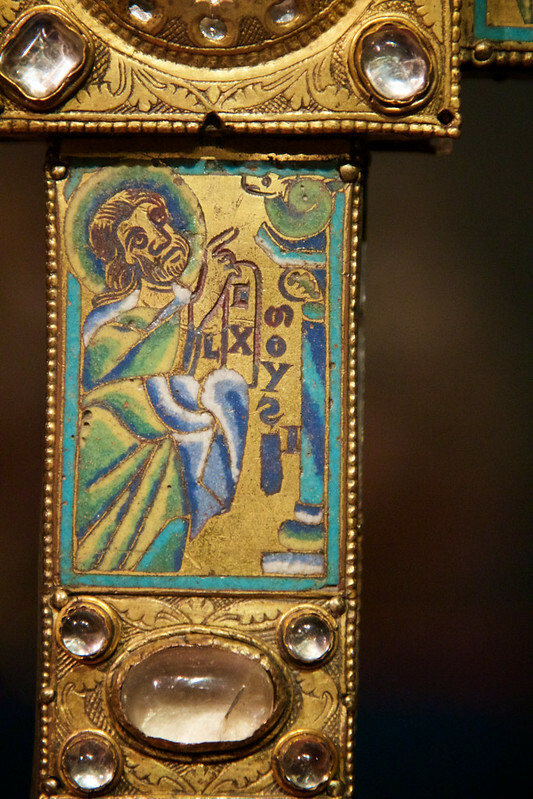 Finally, from a second typological cross in the same collection, we have this image of a woman with crossed sticks from the foot of the crucifix. The Latin Sareptena refers to the Widow of Zarepath in 1 Kings 17:8-24. During the drought and famine sent by God, Elijah meets the widow who is gathering sticks. She has almost run out of food and is going home to prepare a last meal for herself and her son before they both die of starvation. But she trusts in Elijah and feeds him. Her last measure of flour and oil miraculously last until rain ends the drought. 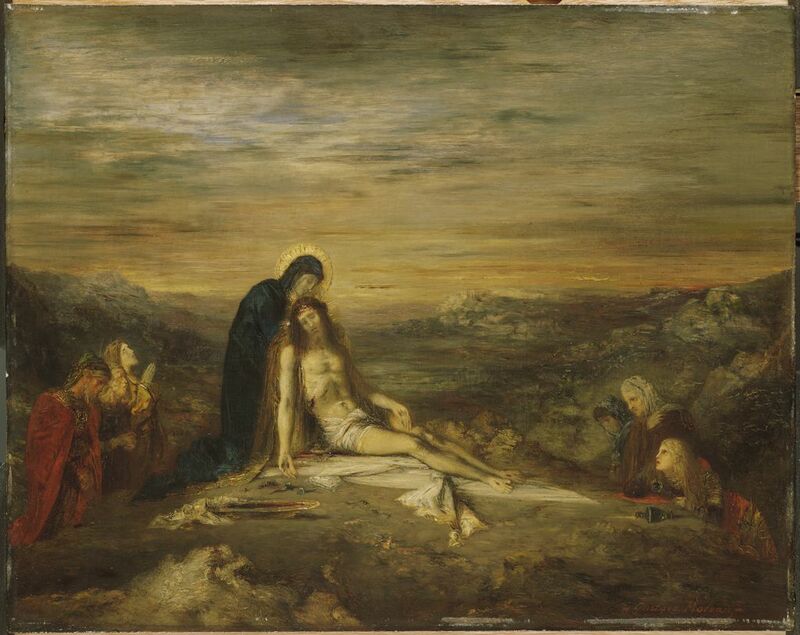 Later, when her son falls ill, Elijah raises him from the dead. 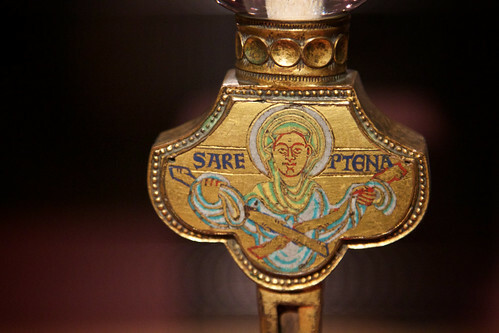 The biblical text says nothing about her sticks being crossed, but on the typological cross she holds them like this as a type of the cross, which provides heavenly food and the hope of resurrection. This is no doubt all very recondite and specialist, but I think it illustrates well the way in which patristic and medieval exegetes tend to treat the literal-historical meaning of the text as a superficial meaning. Getting stuck there is the equivalent of not being able to see that the back of the wardrobe leads into Narnia. I’m not recommending that our students start interpreting the Bible in this way. All I wanted to demonstrate was how historically conditioned and far from “obvious” many earlier readings of Scripture are – so that when we say that past generations of Christians based all their Theology on “The Bible” we’re probably not saying very much. What we should be asking is how they read the Bible. Alister McGrath, “The Return to Scripture” in Reformation Thought: An Introduction, 3rd ed. (Oxford: Blackwell, 1999), 121. Last year, I began the advent calendar with one of my favourite paintings by one of my favourite artists – Belshazzar’s Feast by Rembrandt (find the post here). Recounted in the Hebrew Bible book of Daniel chapter 5, it is a fantastic story of ghostly hands, supernatural writing, and knee-trembling terror, all wrapped up in an atmosphere of gothic horror that’s a delight both to read and to imagine. 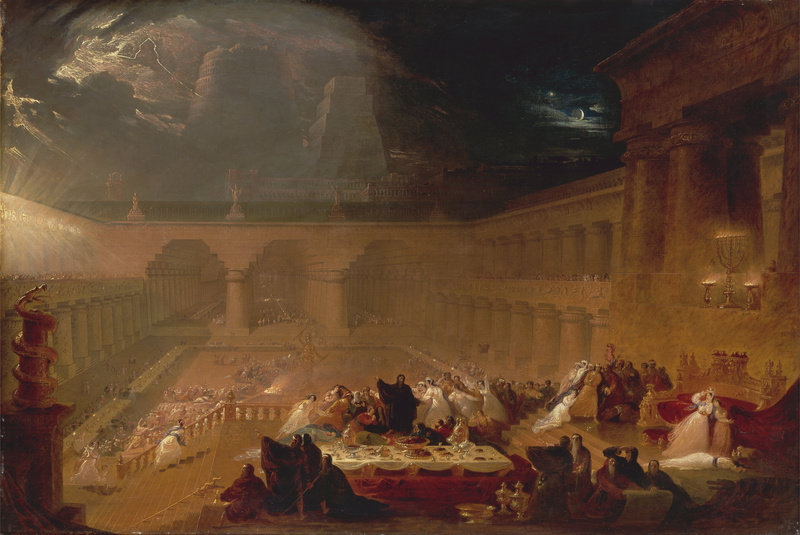 So, for today’s advent offering – as it’s the season for feasts and parties – let me return to this biblical tradition and present you with another wonderful image that depicts it, painted this time by English Romantic artist John Martin. 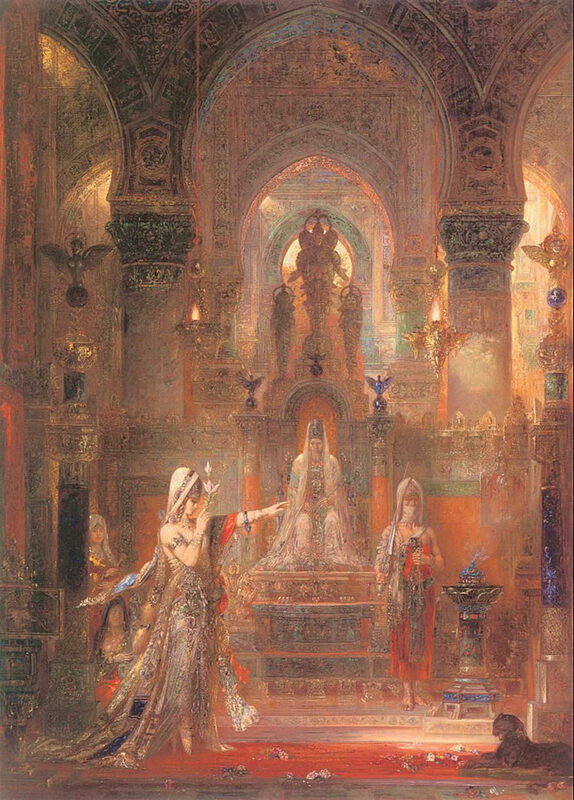 Martin’s visual retelling of this story captures both the sumptuous OTT opulence of King Belshazzar’s feast and the absolute mayhem that ensued once the disembodied hand began to graffiti the palace walls. As yesterday, I’d encourage you to follow this link to find the painting on Wikimedia Commons and then click to enlarge it. The detail you see is incredible – the glint of gold and precious jewels on the dress of the swooning queen, the glistening fruits piled up in shiny gold and silver bowls, the flickering candle flames lining the dining tables that seem to stretch back to infinity in this outrageously huge palace banquet hall. And the sky, just look at that sky – with its crackling lightening and ominous moon, it saturates this painting with a sense of sinister threat and impending disaster. Only Daniel, who stands still and calm in the midst of the melee, seems to offer the party guests any sense of stability or hope of surviving these terrifying events. Little wonder then that they crowd around him, seeking his protection. The drama of the Daniel story is almost palpable in this image and we viewers may be glad that we are at a safe distance from the eerie events that are unfolding. Yet, at the same time, it is a thrilling scene that we encounter here and one I always wish I could witness just a little closer, taking in the scents, sounds, and sights of Martin’s feast with all my senses. It’s Christmas Eve and today’s penultimate advent offering is drawn from another gospel scene oft associated with the festive season – the visitation of the magi (or wise men) to Bethlehem to see the infant Jesus, whom they believed had been born “king of the Jews” (Matthew 2.1-12). It’s a popular image in art (and on Christmas cards), the Magi standing deferentially before the crib holding out their gifts of gold, frankincense, and myrrh. The particular depiction I’ve chosen is from the 19th Century English painter and designer Edward Burne-Jones. 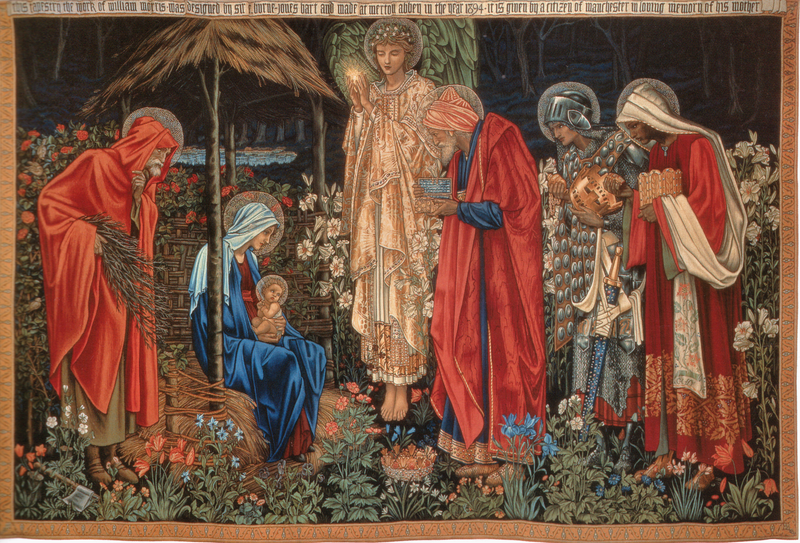 The painting is called The Star of Bethlehem and was the source for a tapestry designed and completed by decorative arts group William Morris & Co a few years later. Both painting and tapestry are utterly beautiful, each with its own vibrant colour palette and attention to detail – I particularly like the plethora of flowers that fill the tapestry version of the picture. 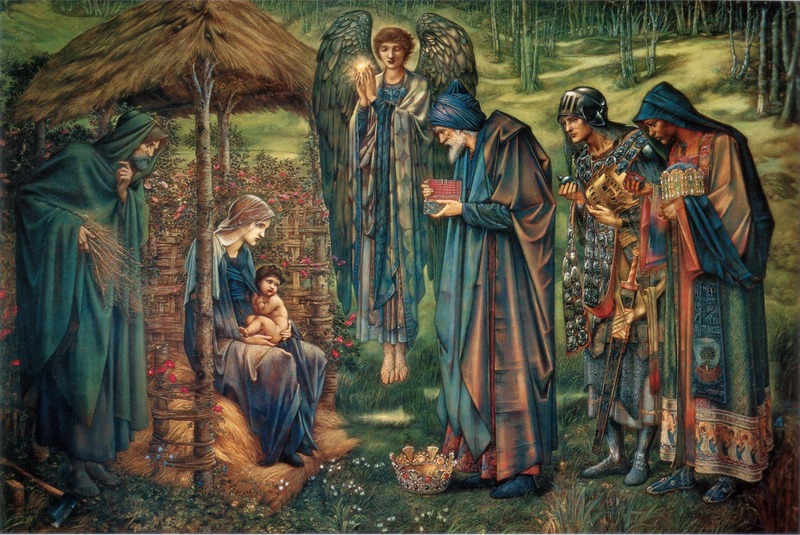 In each image, the magi stand humbly by with their gifts, crowns taken off in deference to this special child. Jesus, meanwhile, sits on his mother’s lap – he looks a tad unsure of these new arrivals, or maybe he’s not taken by the gifts they’ve brought. Both of his parents likewise seem somewhat uncomfortable by this encounter – perhaps it reiterates for them the real strangeness of all the events that have taken place in their lives within this gospel nativity narrative. Only the androgynous angel, who hovers beside the group holding the star of Bethlehem in his or her hand, appears fully at ease, certain that things are all moving along according to plan. The painting I’ve chosen that illustrates this annunciation is by 17th Century Dutch painter Pieter Mulier II. The reason I like it so much is the way that it draws the viewer into the action of the scene. The shepherds and their animals all crowd around the very forefront of the picture – they’re so close to us that we can almost feel as though we are there with them, sitting on the grass beside them, looking straight ahead at the awesome inbreaking of the heavenly realm into the still of the night. While most of the animals site docilely, seemingly unimpressed with the unfolding events, a startled dog to our right has overturned a copper pot – if I stretch out my hand, I think I could catch hold of it. Some of the shepherds, like us, are looking at the angelic figure who is reaching out beyond the ochre-gold clouds to get our attention; others seem to still be asleep, unaware as yet of the amazing sight in the sky. No doubt they’ll soon wake up once the great company of angels start to sing. Tomorrow, we’ll see what happens next in the nativity narrative, once the shepherds arrive in Bethlehem. The image I’ve chosen today for the advent calendar is one of my favourites, depicting that most famous biblical bather, Bathsheba (2 Samuel 11). 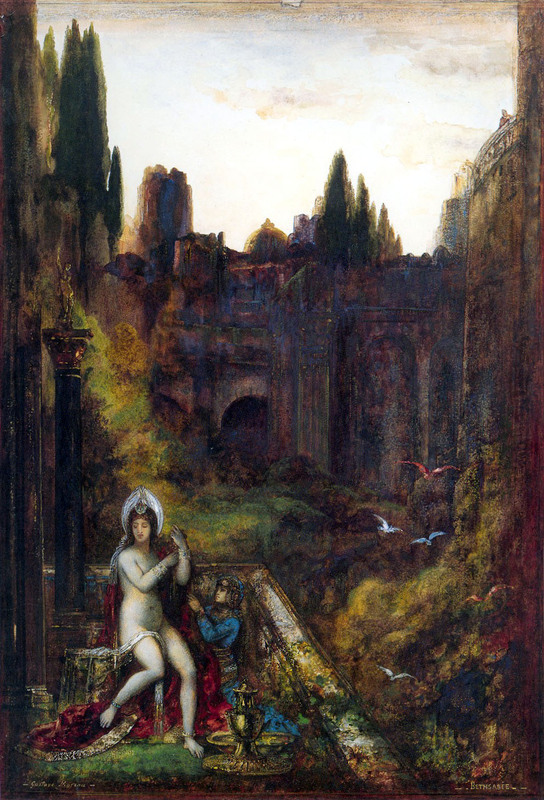 Moreau presents her sitting on an open terrace above some shrubs and trees, surrounded by stone buildings, attending to her toilette in the cool shade of the evening. Her pale white skin is almost iridescent, matching the white veil that sits halo-like around her head and drapes modestly between her thighs. 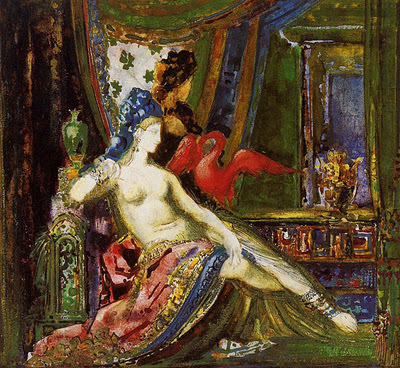 Her ankles, wrists and forehead are bejewelled and in her repose, she is surrounded by a rich rainbow of reds, blues, and golds. This is an exotic Bathsheba, who draws our gaze towards her, just as she draws the fateful gaze of King David, whom we can just make out way above her on the castle rampart. For now, she sits, eyes closed, blithely unaware of his presence, enjoying, perhaps, the cool of the evening breeze on her skin and the peaceful quiet of her sheltered surroundings. Reading the rest of 2 Samuel 11, we learn that this peace will shatter all too soon. 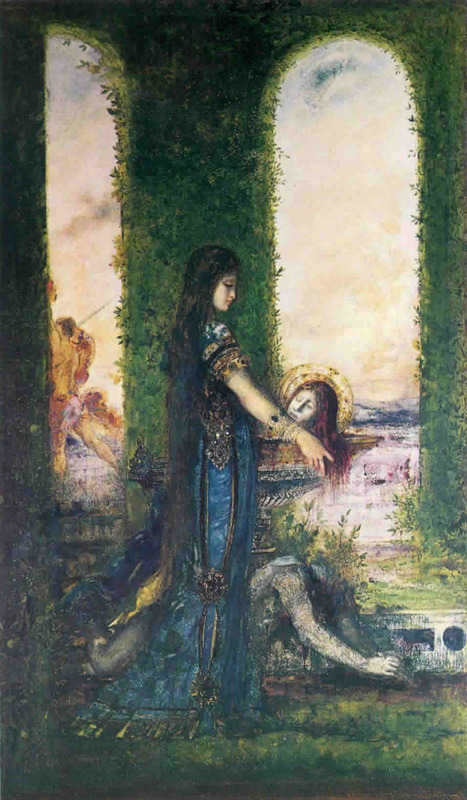 Moreau, however, lets Bathsheba remain, untouched, in this irenic moment, David still a safe distance away. 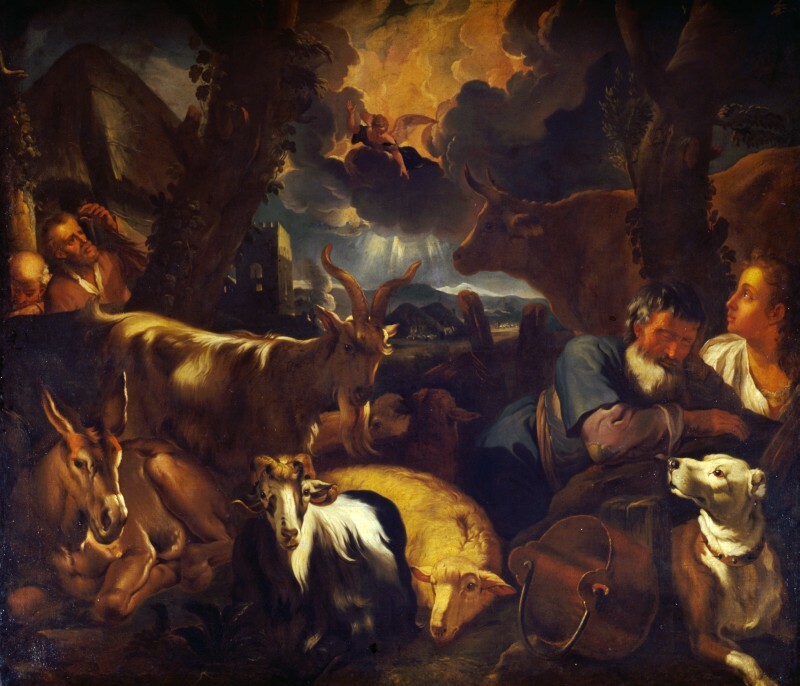 As we move into the third week of the advent period, I’m returning to another Genesis narrative for today’s image – the story of Noah’s ark and the flood in Genesis 6-9. This painting by Jan Brueghel the Elder [remember the gorgeous image of Eden painted by his son earlier in this advent season?] shows us Noah and his family making their way towards the newly built ark, looking as though they are going on a day trip in their fancy 16th Century garb. In the background, a crowd is gathering to watch them, wondering, perhaps, what is going on. Meanwhile, the animals are congregating – some are already paired up, ready to make their way up the gangway, while others seem to still be searching for their boarding partner. 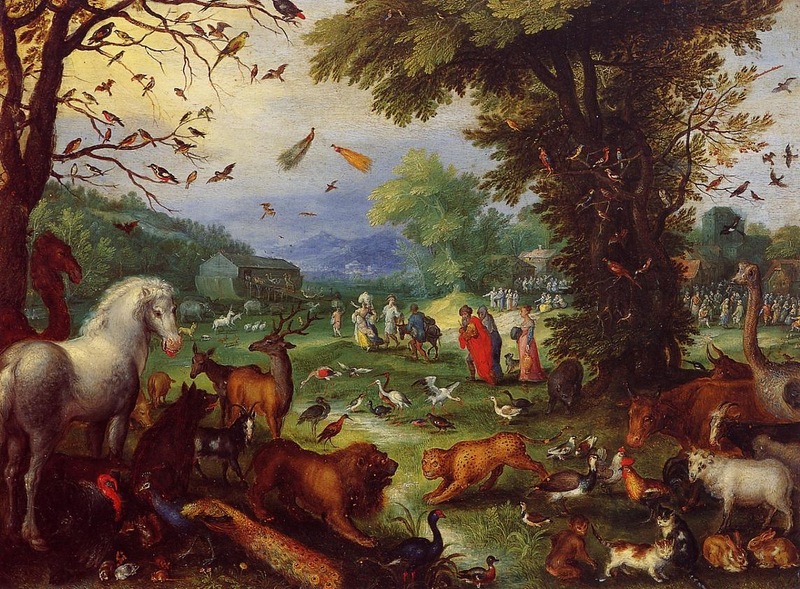 As with Jan Brueghel the Younger’s painting of Eden, this is a glorious image – I’ve spent ages staring at it, trying to recognise the dizzying number of different creatures and species presented there. Is that a pukeko (or its Northern hemisphere lookalike, the moorhen) in the foreground? And what’s the tiny bird perched on the ostrich’s back? From elephants to mice, peacocks to bats, it’s a gorgeous array to behold. My favourite detail, though, is in the centre left of the picture – two unicorns dancing their way towards the ark. According to legend, the reason that unicorns no longer exist is that they were simply too slow getting on the ark and, as the rain started to fall heavier and heavier, Noah had no choice but to close the doors of the ark and leave without them. As I write this, thunder is rolling in the distance, west of the city and clouds are mounting up in an otherwise sunny blue sky. The met service has issued a severe thunderstorm warning with the chance of flash floods later in the afternoon. So, my anxiety is mounting for these poor unicorn in the picture – I just wish they’d hurry up and make their way a little faster towards that open ark door.